Bailey Rothe graduated from Northern Michigan University in 2017 with certification to teach English and social studies. Now she has a job—and a union family. 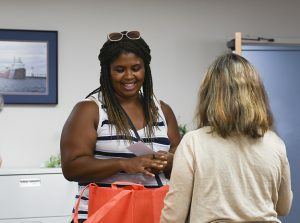 Second-year MEA member Jaimi Nedziwe, a teacher at Lansing’s Willow Elementary School, receives a bag of school supplies at the 8ABF Coordinating Council’s Back to School Bash. Rothe took part in a social event that brought together 500 members and their families from St. John to Holt, Okemos and Lansing. “It’s really nice seeing all these teachers with their families outside of the classroom,” she said. Local leaders and staff from across Michigan have launched an unprecedented effort to introduce newly hired school employees and early career educators to MEA and all that a union stands for and provides. In Okemos, the festivities for members of capitol-area locals included a bag of classroom supplies, music, face-painting, food and giveaways. “We had new people signing up just so they could attend this event,” said LSEA President Chuck Alberts. MEA President Paula Herbart said she is seeing heightened energy at new member events she has attended this summer and fall. She tells new members that 26 years ago she was filling out a new member form and jumping into union activity. “Fundamentally this kind of organizing is the only way that we are going to do anything that makes a difference for our students,” Herbart said, adding it develops future leaders and builds strength for advocacy. In Grand Rapids, newly hired middle school teacher Erin Murphy joined the GREA at a recent orientation event. She appreciates the union’s strength in advocating for public education—which she saw firsthand in New York during a three-year teaching stint there. “This is such a big voice in policymaking to make things better,” said Murphy, who hopes to try out leadership roles in the local association in coming years. 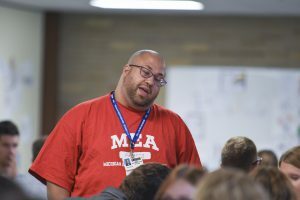 Grand Rapids Education Association Secretary Dan Slagter talks with new hires about the collective voice that MEA brings to social justice and equity issues in education. That was the point made by GREA Secretary Dan Slagter, a Grand Rapids art teacher who serves in various leadership roles at the local, county, state and national levels. Slagter told more than 90 new hires assembled for the meeting that MEA is a vehicle for making students’ lives better. “As a union, we are the biggest collective voice out there talking about social justice and working to address the inequalities our students are facing,” he said. For others, particularly those who previously worked in low-paying, non-union charter schools, Madafferi said their interest tends to be more in the issues of compensation and working conditions. Ann Arbor Education Association President Fred Klein said he has heard awful stories from new hires coming from states without unions or collective bargaining or from non-union for-profit charter schools. “Now it is more important than ever to organize, join together, and fight for our students, our jobs, and our public schools,” he said. As in many school districts across the state in recent weeks, local leaders in Clarkston welcomed new employees with a luncheon that included member information packets and get-to-know-you talks with building representatives, said MEA UniServ Director Terese Fitzpatrick. Additional plans included a meet-and-greet on opening day, a homecoming tailgate, and other get-togethers to build community and networking, in addition to ongoing conversations between veteran and newer colleagues. In addition, leaders across the state are planning professional development for new members on topics that include evaluations, certification, financial planning, and other issues of interest to early career educators. “We want to show folks that this is what we do—we’re here for you, and we can help in any way you need,” said Okemos Education Association President Lisa Crites. MEA Secretary Treasurer Brett Smith said he has seen great turnout and interest in the union during his travels around the state to speak to members at orientations, social gatherings, and trainings. Smith enjoys helping new and existing members understand all that the union does at the local, state and national levels. Many see the value of collective bargaining and advocacy for members at the local level, but do not know the bigger picture, he said.